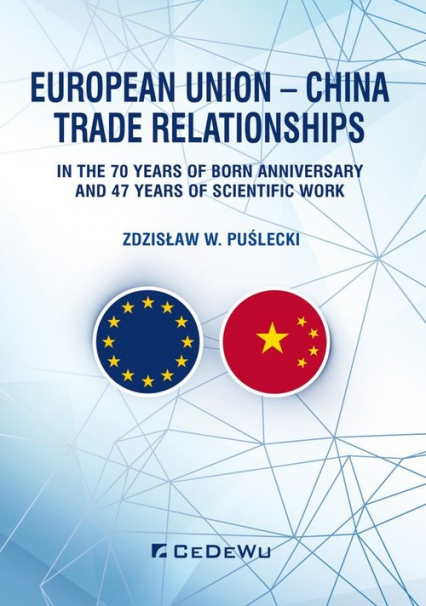 In this research work, Author focus on the analysis of the trade relationships between European Union and People Republic China. Realistic point is important trends in the trade regime between EU and China. China is already in the process of rebalancing its economy towards greater reliance on domestic drivers of growth, in particular consumption. In order to continue its fast convergence in living standards with more prosperous societies, China will also need to increasingly rely on multifactor productivity gains as the key engine of growth. Labour productivity in both manufacturing and services are under 10% of the US level, demonstrating the distance to the technology frontier. Although the agriculture sector is a much smaller share of the economy than in the past, there is also ample scope to improve its productivity while easing resource constraints by strengthening agriculture innovation. A possible policy road map for sustaining this transition towards a more inclusive, high-productivity. China is slow in transforming the achievements of technological and scientific research into production. China is weak in industrial innovation. The upgrading of the industrial sectors among state owned enterprises lacks the support of capital and technology. These weak points have become obstacles in the quick development of a knowledge-based economy. China's domestic reforms will determine whether its economy will be transformed into a more sustainable model and more effective model. In this sense, Chinese foreign policies are an extension of China domestic politics. The EU should review its current trade policy strategy based on bilateral deals and re-focus its trade policy on the WTO. EU should also adopt a truly global approach in its trade policy towards China. This means involving not only the United States and Japan, but also successful mediumsized industrial and emerging economies. Areas such as, trade reciprocity and inward investment illustrate how important successful bilateral links between the two economies are to future prosperity. A long-termed stability of China depends on the fast economic growth, which is possible only when this country will be a partner able to play global roles. Question raised is whether the West with EU will see China's rise as an opportunity for cooperation or for conflict. Economic growth is generally more preferable in China to military and extensive expansion.